Men's Rebuild is an internal cleansing system to cleanse, protect and rebuild from the inside out and contains 3 separate products: men's rebuild, herbal guard and colon care. 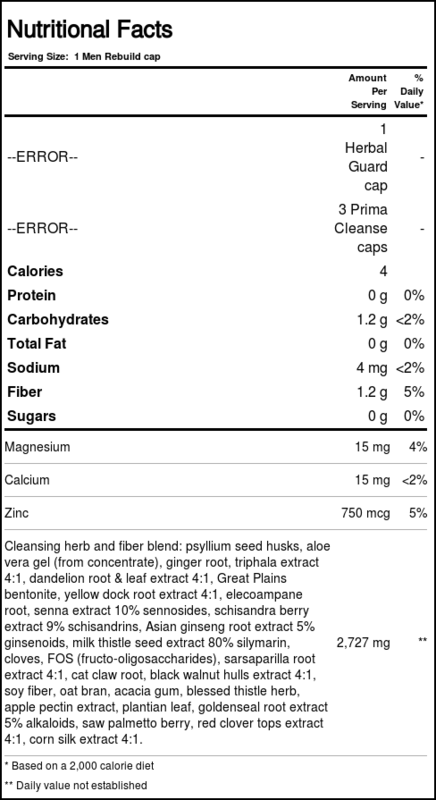 Men's Rebuild Cleanse removes toxins. Yerba Prima pioneered development of natural dietary fiber and internal cleansing products and offers a full spectrum of natural products. Do I need the Internal Cleansing System? We are all exposed to numerous toxins and chemicals at work, at home, even in the air we breathe, the food we eat and the water we drink. As a result, we can get stressed and tired. Even active bodybuilders and athletes get digestive problems or constipation related to our diets and busy lives. We want to achieve new levels of vitality, health and enjoyment of life, and avoid long-term health problems. Over 15 years ago, Yerba Prima developed the original Internal Cleansing Program. Men's Rebuild Advanced Formula for Men is an improved program designed to help men achieve maximum health and vitality. This is the most complete system available for cleansing, protecting and rebuilding the total body. Key requirements for optimum vibrant health include good digestion and assimilation of nutrients, the ability to constantly neutralize toxins within the body, proper elimination of waste and toxins, and maintaining a high energy level. Men's Rebuild Internal Cleansing System is designed to meet all these key requirements, through its ability to cleanse, protect and rebuild. The Advanced Internal Cleansing System is designed to be used daily as long as desired for thorough cleansing and daily maintenance. Notes: Quality Assurance: Yerba Prima's products are pure and natural and are made from the highest quality ingredients. Recommended Use: Level 1: Begin by taking the following amounts between meals morning and evening: 3 Colon Care capsules, 1 Men's Rebuild capsule, 1 Herbal Guard capsule. Take each serving with at least 8 ounces (a full glass) of liquid. Drinking additional liquid is helpful. We suggest staying at this level for 3 days to a week. Level 2: Increase to the following amounts between meals morning and evening: 6 Colon Care capsules, 2 Men's Rebuild capsules, 2 Herbal Guard capsules. Take each serving with at least 8 ounces (a full glass) of liquid. Drinking additional liquid is helpful. See product insert for additional information on cleansing and how to achieve maximum results. 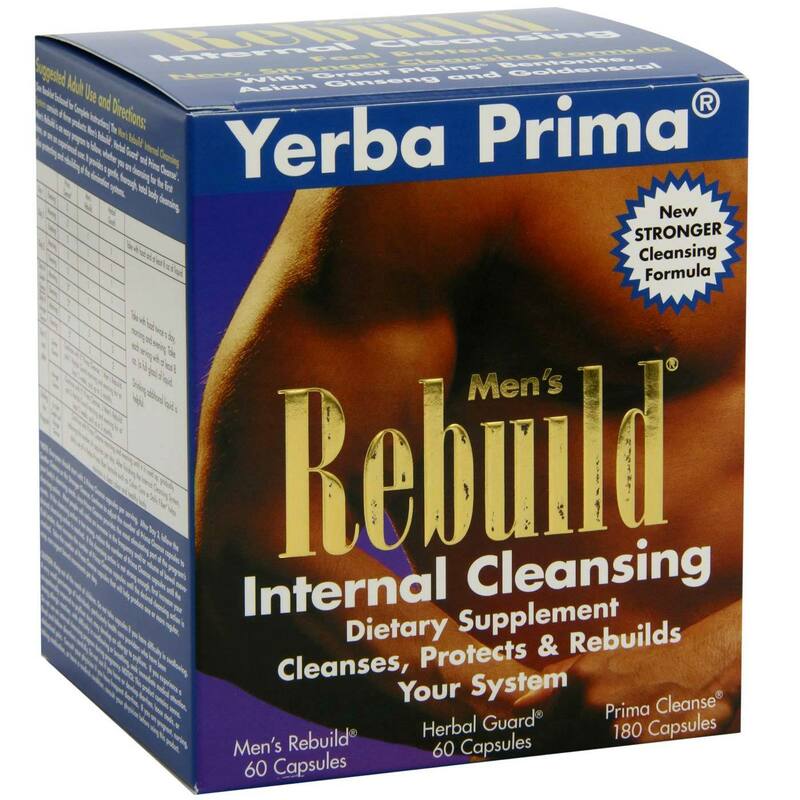 The customer reviews posted below are based on individual consumer experiences and may NOT necessarily represent what expected results will be from using or taking Yerba Prima Men's Rebuild Internal Cleansing System - 1 Rebuild System. These results may not be typical and you should not necessarily expect to receive the same results. Actual results may vary. Good quality at an affordable price. Wonderful complex cleaning of the whole body. After applying, I felt light and my appetite immediately fell. The drug is enough for several cycles. When finished, I will order again. I've used this item for several years now. The effects are mild without any side effects. Although it's a lot of pills to take, it's not at all intrusive. Effects are as indicated on labeling.